San Francisco, CA : Jossey-Bass, 2009.
viii, 262 pages ; 24 cm. Living in a happy family is good for one&apos;s health, longevity, productivity, and success, so it is important to follow these humorous tips for a healthy and harmonious home life in good times and tough times. 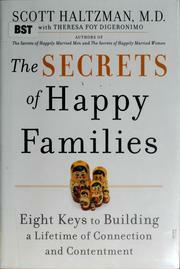 The secrets of happy families : eight keys to building a lifetime of connection and contentment / Scott Haltzman with Theresa Foy DiGeronimo. $c Statement of responsibility Scott Haltzman with Theresa Foy DiGeronimo. 504 BibliogEtcNote $a Bibliography, etc. note Includes bibliographical references (p. 243-249) and index. 505 ContentsNote 0 $a Formatted contents note What is a family? -- What is happiness? -- Happy families--stick together -- Happy families--commit and communicate -- Happy families--lean -- Happy families--teach to and learn from children -- Happy families--blend -- Happy families--handle conflict -- Happy families--bounce -- Happy families--breathe -- Happy families--evolve. 520 Summary Etc. $a Summary, etc. note Living in a happy family is good for one&apos;s health, longevity, productivity, and success, so it is important to follow these humorous tips for a healthy and harmonious home life in good times and tough times. 650 Subj:Topic 0 $a Source other than LC Families. 700 AE:PersName 1 $a Name DiGeronimo, Theresa Foy.